Need an in-law suite in your home? Look no further! This thoughtfully designed custom build includes an attached apartment with its own kitchen, great room, bedroom, handicap-accessible bathroom, access to laundry room and separate entrance. Spread over 3,028 square feet under air, this waterfront pool home has five bedrooms, three baths including a pool bath, formal living room, formal dining room, family room and eat-in kitchen. Situated on a quiet oversized corner lot and a freshwater canal with access to other freshwater lakes, this spot is great for fishing! 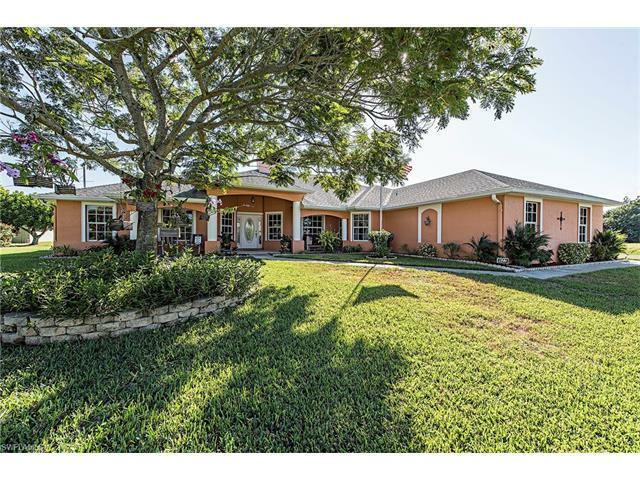 With its mature trees, lovely landscaping and a fenced-in yard, this property is also great for children and pets. The large heated salt water pool and spa has aqualink and a new paver screened lanai with expansive protected overhang. Some features include: solar electric system, low electric bills, double-sided woodburning fireplace in the dining and family room, solar tinted windows, surround sound wired, satelite dish, and mbr custom closets. Close to gulf-accessible boat ramp, shopping, dining, public parks, playground, golf course, hancock bridge (no tolls) and downtown ft myers, it is perfectly located!